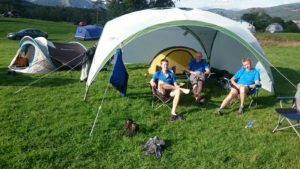 Bremex members convened at the National Trust campsite at Hoathwaite on Lake Coniston, just outside Torver, on Friday afternoon. After pitching our small tents and a new camping shelter which one of our group was trialling for his Duke of Edinburgh Award scheme work, we walked along the lakeshore to Coniston village. It was drizzling, which was not a good omen, but omens should not aways be believed. A hearty meal at the Sun Inn helped to brighten things up as plans for the weekend were discussed. We set off back to the campsite at a sensible time, but by now it was raining harder. Saturday dawned wet, but despite a poor forecast, the precipitation diminished as the day progressed. We got off to a slow start, hoping that the rain would ease, intending to stick to our plan to do a mountain walk with an easy scramble if conditions permitted. After a steep drive out of Coniston we arrived at the Walna Scar road car park at about 10.00am. There were few other people about except for some hardy souls heading up the Old Man of Coniston. 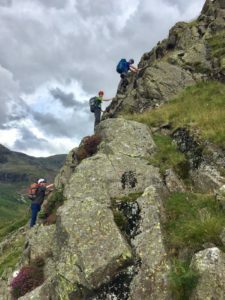 The constant drizzle caused a brief vacillation before group dynamics took over and and we moved out into the wet, our initial aim being a grade 1 scramble on The Bell, a hillock close to the car park. It continued to rain, making the route trickier, but not too risky, and difficulties were overcome without incident or the need for ropes or gear. 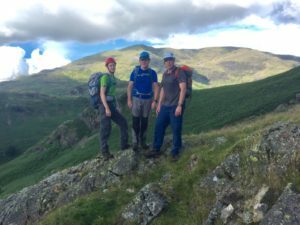 The rain seemed to be easing at the top, so we decided to carry on into the Coppermines valley, then up Red Dell valley for further scrambles, potentially with a summit on Wetherlam. As we walked on the weather continued to improve: it stopped raining and the sun came out. Leaving other walkers behind, we continued up Red Dell alone. As we approached the head of the valley, the grade 2 scrambling line of Lower Hows, on the east side, became obvious and inviting. By now the rock was remarkably dry and even though this was a grade above the Bell, again the scrambling was pleasant and enjoyable. The route finishes below the ridge line that links to Wetherlam, so we plodded uphill for a bit before joining the path north to the summit, where we were afforded fantastic 360 degree views in the now excellent weather – our perseverance had paid off. To return to the valley we headed off Wetherlam in a north easterly direction, following a circuitous route back to Walna Scar Road via the Crook Beck and Coppermines valleys. After an inauspicious start we’d had a real Quality Mountain Day with two excellent scrambles included! The evening was pleasant and sunny. After hot showers at the campsite we headed to the Wilsons Arms in Torver for another hearty pub meal and several beverages, which we surely deserved. Sunday dawned bright and sunny, making the taking down of tents and packing up a more pleasant experience than it would have been in Saturday morning’s drizzle. 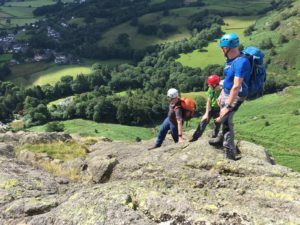 Our plan was to take advantage of the bright weather forecast for the earlier part of the day by doing some grade 2 scrambles from Coniston village itself: Long Crag Buttress, a grade 1 with 3 stars, and Mouldry Bank and Rascal How, a grade 2. These routes are literally at the entrance to the Coppermines valley, so it was only a short walk in. We had to negotiate thick bracken to find the start of the grade 1, but once this was done the route turned out to be very good, the best of the weekend. 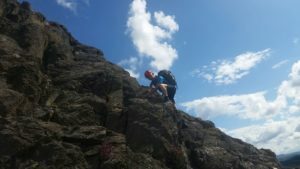 It was the longest scramble of all four and again went up towards the ridge that leads north to Wetherlam, although on this occasion we only ascended as far as necessary to find a convenient route back down to the track in the Coppermines valley. We then located the start of the second grade 2 scramble, which proved to be more of a disjointed affair, petering out somewhat; nevertheless we were pleased to have bagged two scrambles on our second day. After coffee and cake in Coniston village we went our separate at about 3pm. My drive back home through the Lakes and across the Pennines was beautiful, although east of the Pennines the rain started again.